If you are reading this blog and know of The Price Of Motherhood, then I am most certainly preaching to the choir. However, if you do not not know Ann Crittenden, then as a mother, I believe you should. I will say no more, other than, women should always stand strong, together, united. There have been too many points in recent (and distant) history that have taken (or prevented us from having) our voice, our freedoms, & our basic rights to do what I write about each week, breathe in this life. Please join what I believe is one of the Good Fights, to secure equal rights for women and mothers all over this globe, and to protect our future generations. Baby Friendly Hospitals On the Rise! To my constant friend and brave companion, Alaha, stay strong, your country Afghanistan needs you now more than ever! And to the new incoming class of Afghan women at IEAW, welcome to America! I look forward to meeting you in a few days! 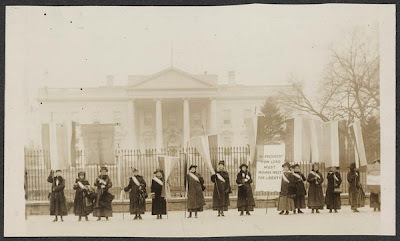 *Suffragists picketing in front of the White House. Harris & Ewing. 1917. You are absolutely right. Women should always be strong and determined to support each other. If we do not seek and put efforts to have our basic rights which God has given all women, no one will come to give it to us. I think women should try to make this world a better place for themselves, their children and all women around the world. Thank you very much for such a wonderful website.